Slowly the visitors are coming back to celebrate what a lot of people might think is the last hurrah for the beaches. Not so fast. The fall schedule for all the beaches is strong with activities, events, arts and entertainment to satisfy everyone, including the young ones. The Labor Day Holiday week-end is looking so good. The weather? Those blue skies and that ocean keep us here week after week. September is one of the best months. If you are visiting us, have a great time. Relax and kick back. Check the following events. 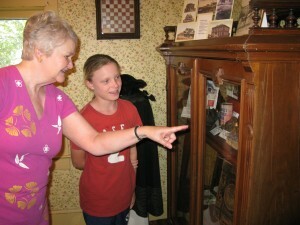 Friday, 9/2 – Rehoboth Beach Museum offers Guided Tour of the Anna Hazzard Tent House. It was built in 1895 for use as housing during religious camp meetings, the Anna Hazzard Tent House is located at 17 Christian St. It was originally located on Baltimore Ave., and moved to its current location in 1975 and opened as the first Historical Society museum in 1977. Natalie Becker will be your host. 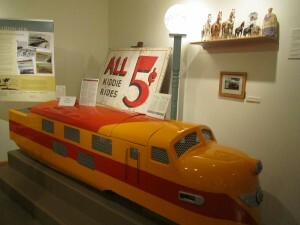 Tour goers will then drive to the Rehoboth Beach Museum located at 511 Rehoboth Ave. 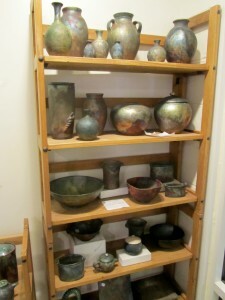 The museum, formerly the town’s ice house, is currently hosting a few exhibits. “Rehoboth Speaks: The Story Nation’s Summer Capital” tells the story of the founding and growth of Rehoboth Beach. 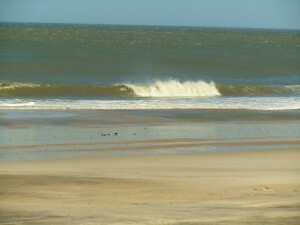 The other exhibit is “Skimming the Surface: Surfing, Skimboarding and Flotating off the Delmarva Coast. 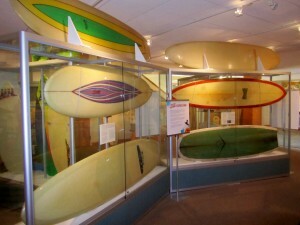 The exhibit celebrates the active surfing community that thrived in the 1960s and 1970s on coastal Delmarva. 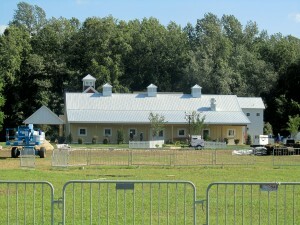 The tour starts at the Anna Hazzard Tent House at 9:00 a.m. It is free of charge but space is limited. You must register by calling 302-227-7310 to reserve your space. 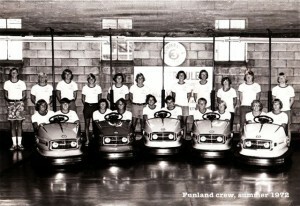 Funland – Exhibit – For many summers, locals and visitors alike have flocked to Funland, the popular amusement park on the Rehoboth Beach Boardwalk, for games, rides, and fun. The Rehoboth Beach Museum is now celebrating Funlands’ 50th year in business with a display of photographs in the museum’s main corridor. The snapshots illustrate the fascinating history of the popular destination, which was originally called the Sport Center before it was bought by the Fasnacht family in 1961. After refurbishing the building and rides after the devastating storm of 1962, the Fasnachts opened Funland to the public, and since then, it has become one of the city’s treasured pastimes. The Museum is open Mondays, Thursdays and Fridays from 10 a.m. unitl 4 p.m. Saturdays and Sundays from 11 a.m. until 3 p.m. Regular admission is $5 for adults, $3 for seniors, college students and military, $2 for children ages 13-17. For more info., please call 302-227-7310. 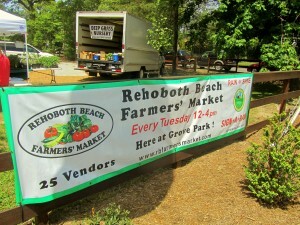 Tuesday, 9/6 – Rehoboth Beach Farmers Market from Noon until 4 p.m. at Grove Park. Baked goods, fresh produce and flowers. More info? Please visit www.rbfarmersmarket.com. 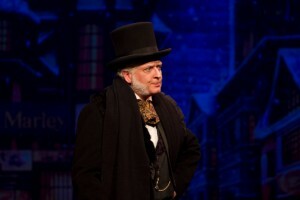 Scrooge Auditions – Scrooge is coming back for another spirited holiday season. Clear Space Theatre Company’s own original musical version of the classic Charles Dickens tale has been revamped for its annual production, which starts November 25th at 7 p.m.
For auditions, please contact Michael Mathias at michael@clearspacetheatre.org, or you can visit www.clearspacetheatre.org for more info. Clear Space Theatre Company opens it newest production, “Broadway Rhythms” on September 23rd and the organization will celebrate the start of their seventh season in a big way. The season kick-off event, “A Night ‘On the Town'”, will be an evening full of food, friends and great entertainment. It will begin at 5:30 p.m. with drinks, appetizers and a silent auction at the theatre. Festivities then move to 4 of Rehoboth’s best restaurants for dinner at 7:00 p.m., with choices of Adriatico, Cafe Azafran, Eden and MIXX. 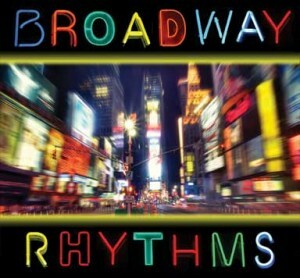 at 9:00 p.m., patrons will be treated to the premier performance of Clear Space’s newest production, “Broadway Rhythms. Following the performance, audience members will have the chance to mingle with the cast and crew. Limited tickets are available for the opening night gala, priced at $100 per person. It includes two drink tickets, appetizers, dinner and the show. No online purchase is available for this particular event. Please call the box office at 302-227-2270 to reserve. The run will continue from September 24th to October 9th. Tickets for those performances will be $25 for adults, $20 for seniors, $15 for students and $5 for children 12 and under. They are available at www.clearspacetheatre.org, by phone at 302-227-2270 or in person in the box office located at 20 Baltimore Ave.
Saturday, 9/3 – Race – 21st Last Blast Prediction 5K – from 6:30 a.m. until 9:30 a.m. at The Grove Park in Rehoboth Beach by the roundabout. 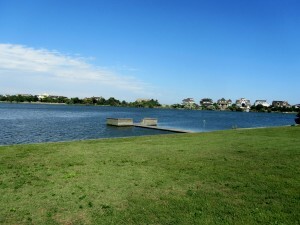 For more information, please visit www.seashorestriders.com. Or, contac Tim Bamford by emailing him at Tim@seashorestriders.com. Saturday, Sunday, 9/3, 9/4 – Sundance 2011 – A benefit for CAMP Rehoboth Community Center. It is a 2-night event at the Rehoboth Beach Convention Center located at 229 Rehoboth Ave. CAMP Rehoboth is a 501(c)(3) non-profit, gay and lesbian cummunity service organization originally created to create a more positive relationship among all the people in the Rehoboth Beach area. For more info., please visit http://www.camprehobothcom. Opening on Saturday, 9/3 the Sundance Auction and Cocktail Buffet with open bar, silent and live auctions from 7 – 10 p.m.
Sunday will be The Sundance – The party begins at 8 p.m. with dancing until 2 a.m.
Tickets are $80 for both events or $45 for each one. They are available through the website above mentioned or at CAMP Rehoboth tel. 302-227-5620. Wednesday – 9/7 Screeing of Illegal at the Screening Room located at Movies at Midway on Rt. 1. It is FREE. Tania is a former teacher from Russia, and is living in Belgium with her 13 year old son, Ivan. Living in constant fear of being discovered, one day she is stopped for a routine police chedk and subsequently arrested…90 minutes, not rated. It is in French and Russian with English subtitles. Around the World is a series of critically acclaimed, award-winning, international independent films. It takes place on the first Wednesday of each month from September until May. For more info., please call the Film Society at 302-645-9095 or you can also visit http://www.rehobothfilm.com. Monthly Screening Series from the Rehoboth Beach Film Society – The mission of RBFS is to promote the art of film and, through outreach initiatives, to entertain, educate, and enrich the cultural life of local and extended communities. In a Better World – Thursday, 9/22 at 7:00 p.m. at DiFebo’s in Bear Trap Dunes, Friday, 9/23 at 7:00 p.m. in the upstairs screening room at the Movies at Midway. In a Better World centers on Anton, a doctor who commutes between his home in an idyllic town in Denmark and his work at an African refugee camp. In these two very different worlds, he and his family are faced with conflicts that lead them to difficult choices between revenge and forgiveness….Danish and Swedish with English subtitles, not rated, 119 minutes. Following the screening, Eric Kafka (President, RBFS Board of Directors) will lead a discussion. Eric is a psychologist with a private practice in Lewes, DE. He has coordinated and let analytical discussions of the Film Society’s What Makes us Tick? program for the past 3 years. Monthly screenings are $3 for members with current membership and card presented, and $5 for non-members. For more information, please call 302-645-9095. Or, visit www.rehobothfilm.com. Friday, Saturday, Sunday – 9/9, 9/10, 9/11 – 15th Annual Delaware Antiques Show and Sale at the Rehoboth Beach Convention Center. Friday and Saturday from 10 until 6 p.m.
Sunday from 10 until 5 p.m.
$6 Admission. For more info., please call 302-542-3286 or 302-226-5456. The show and sale will feature selected exhibitors offering 18th and 19th century American, primitive and period furniture and accessories, among other items. 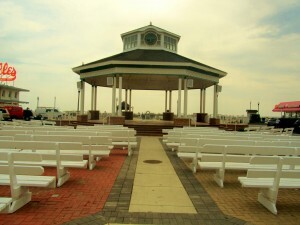 Rehoboth Beach Bandstand – Labor Day Week-End Entertainment at 8:00 p.m.
Friday, 9/2 – The Diamonds – It has been over 50 years since they released the hit called Little Darlin’….If you cannot remember, then you were too young so please visit www.thediamonds.com because they are still putting on a great show. Saturday, 9/3 – Mario Rocco – He calls it The Parade of Stars, a mixture of some of the best of recognizable performers. He has opened for The Temptations, The Drifters, The Coasters and many others, including being chosen to perform for the President at a 911 benefit concert. More info.? please visit www.mariorocco.com. Sunday, 9/4 – DSU Approaching Storm Marching Band – It has gained both national and international acclaim, performing in England, The Netherlands, and the National Football League at Veterans Stadium, Ravens Stadium, JFK Stadium and the Pontiac Silverdome. That’s all for now. 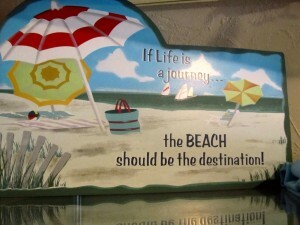 Please enjoy the beach and have fun….talk to you later…. There was no way I was having any more of my leftovers last night. I don’t know what I was thinking when I decided to cook everything in the refrigerator in the event the electricity went out. I guess I thought it would be out for weeks. My husband said he would not have any more ground beef. That was it. So, my mood changed to something lighter; ate way too much during Irene. I thought Saketumi would be the perfect place for a Monday night. 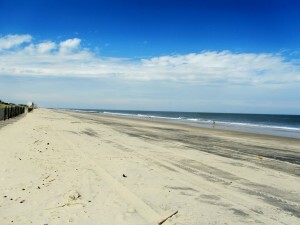 Due to Irene not a lot of people were at the beach, but that will change soon this week-end. 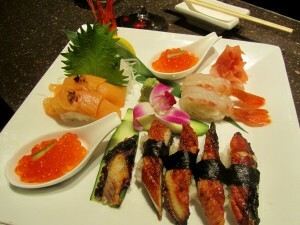 Saketumi is located at 18814 Highway One, Rehoboth Beach, DE 19971 and it has plenty of parking available. Tel. 302-645-2818. Website? 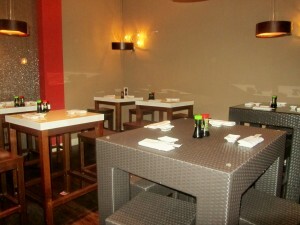 www.saketumirestaurant.com. I have written about this restaurant before. 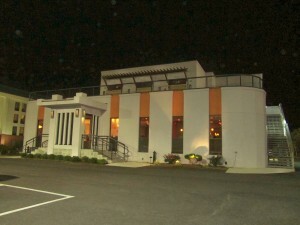 It is a modern building with plenty of seating choices; even a terrace on top of the building, as well. My choice? 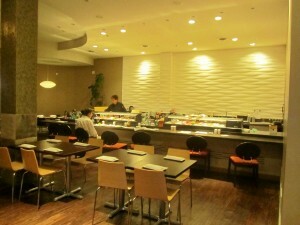 The sushi bar. That is where I usually find Tanaka Sam, who is the Sous Chef. 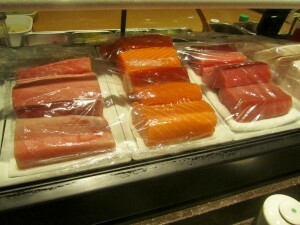 I love seating at the sushi bar because I can interact with all of them. 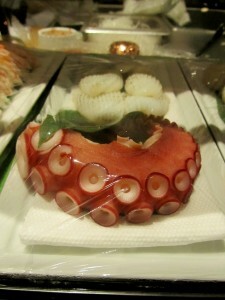 Tanaka always gives the sushi bar patrons a little taste of what is soon to be a very pleasant dining experience. If you decided you are not a sushi aficionado and not really into it, then, don’t worry because this very modern Asian restaurant offers a variety of foods; Japanese, Thai and Chinese among others. They have tempuras, curries, noodles, rice and woks. 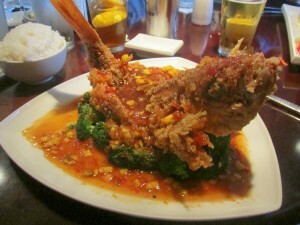 One of the dishes I have had in the past is a whole fish with that chili sweet sauce and very crispy. It’s a good one!! Don’t let it intimidate you. Our waiter was Dimitar. He has served us before and is always attentive, prompt and knows his menu well. Tanaka and I got the conversation going. We talked about the weather; his family lives in N.Y. At times I had to ask him again to repeat what he had just said; then, I laughed because he probably could not understand my accent either. His sushi and sashimi presentations are outstanding. Totally gorgeous and a work of art. Last night I had their Firecracker Roll. A little spicy with a nice kick to it. 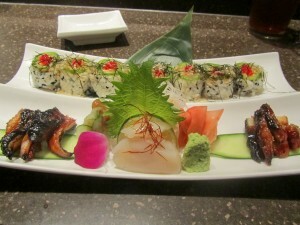 I also had the scallops, sashimi style and the Unagi, which is eel. And, let’s not forget real wasabi. 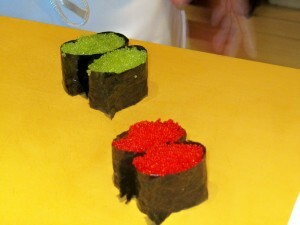 There is a big difference to the wasabi you get at different sushi restaurants. Unless you ask for real wasabi, if they have it, all you are getting is horseradish, mustard and food coloring. Very little or no wasabi is found in that paste. Wasabi is a root which must be finely grated before serving. It is perishable and it does cost a bit more. My husband had different choices of sashimi and sushi on his plate. Guess what? They do have gluten free/wheat free soy sauce. 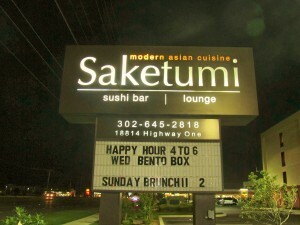 Saketumi is available for events, on Sundays they do have a brunch and most every day of the week they have specials and happy hour. Even though I have written about Saketumi before, I decided to do it again. They have been consistent from day one. 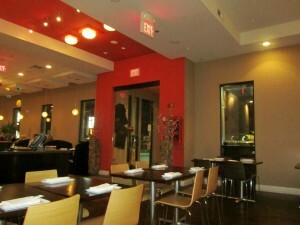 The staff is friendly, the restaurant is nice and the food is really good!! My family does visit Saketumi often. I guess we are regulars, right? Note: I don’t want to forget to thank Kim, the Manager. Always very friendly and welcoming. 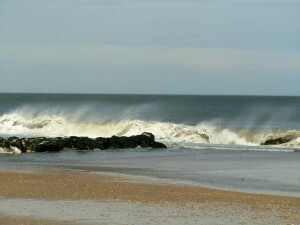 After the nail biting, hair raising past couple of days, Irene, left us with the perfect beach day. 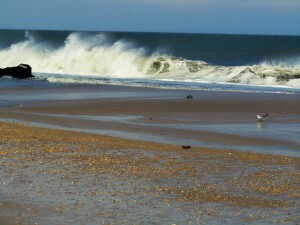 If you have been to Rehoboth in September, then, today was one of those days that felt just like that. Not too many people, gorgeous weather; that something in the air that tells you the season will be changing soon. There is no argument in the fact that so much revenue was lost this week-end. The outlets were still closed Sunday; that never happens. The restaurants, bars and other entertainment venues wer slowly getting back to business. Dewey Beach had Que Pasa opening at 4:30 p.m. and Hammerheads was opening at 5:00 p.m. tonight. Sodel’s restaurants were opening tonight, as well. FishOn, Betty’s, Matt’s Fish Camp, Bluecoast, Northeast. If you go to their Lupo di Mare restaurant located on Rehoboth Avenue, you might event get some of my figs. I dropped them off; don’t know what they are making with them, though. 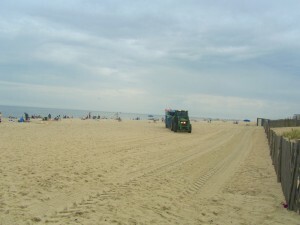 I took a drive and at Rehoboth by the Sea the view of the beach was fantastic. Did not seem to have suffered any erosion. The dunes looked intact. The town was open and visitors were back!! On the north side of the Rehoboth Beach Boardwalk the beach looked gorgeous too. 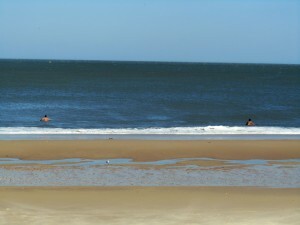 A few swimmers were enjoying the day like nothing had happened. 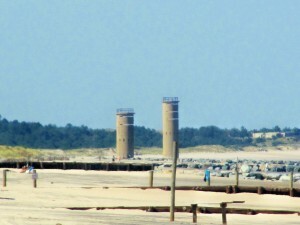 The World War II towers were still there; always watching the coast. Silver Lake? What can I say? 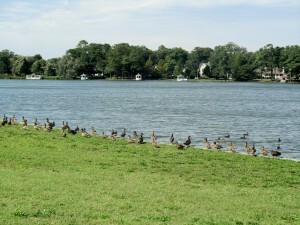 It is a special place and a waterfowl sanctuary. 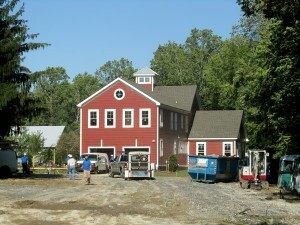 The construction site for the Jusst Sooup Ranch is located on Rt. 9. The area is called Coolspring. I went to check it out to make sure the structures they started not even a week were all there. The show, probably, had never encountered so many weather related inconveniences. Surprise!! 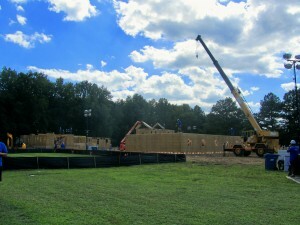 Sod was already on, they were finishing her house. Monday, volunteers can go to Cape Henlopen High School and take the bus to the site. Wednesday is reveal day between 10 and Noon. Take the bus and be there early if you want to see it. As I turned on the road that I was not supposed to be on, I saw Mark. He was the security guard that I spoke to in several occasions and who was always cheerful and nice. You look familiar he said. Yeap, can I go through this road? I am only going home. He let me go but not before telling me that besides a little water here or there, the construction site and the sod did very well. From the beach to this road is only about 6 miles; the scenery so completely different. 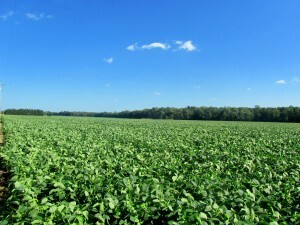 Soybeans on one side, corn on the other. You would not believe that you are so close to the beach. It is like night and day. So, after all the facebooking last night, all the food cooked, all the worries, then I am just thankful. 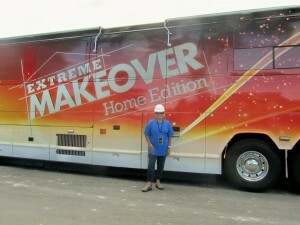 The “Extreme” is what has been happening in my neck of the woods, which is Rehoboth Beach, Delaware. 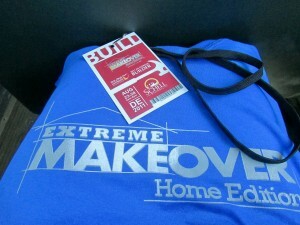 Besides having Extreme Makeover: Home Edition causing a stir in the community. A good stir, by the way. We have had a drought, an earthquake, a tornado, a hurricane, and now I have too much food in anticipation of the electricity taking a break. I have cooked like I have a shelter going on. My neighbors are here, so maybe they might want to stop by. Wind and rain. Addy, my rescue is under the bed. No sight of her for some time, I imagine. In the turmoil of preparation, there has been humor. I have the friends in Rehoboth that went to get their dog from the kennel and the Town of Rehoboth would not let them back in. They thought they would come here but they managed to sneak back into town. I don’t know if they have much food; their neighbors are there too. They are all locals and they can handle the weather, if you get my drift. I had not heard from Missy. She is my partner in crime. She loves scrapple as much as I do. Her husband is a River Pilot. I do want to thank him and his fellow pilots for doing the work that is so dangerous; moving those boats, ships, ferries on the Delaware Bay. I had to call her. They are riding the storm, as well. She is going to miss us next year. Then, Victoria is also in town. She and her husband, Tom, own Red Square on Rehoboth Avenue. Martinis, anyone? She has the good stuff. In Rehoboth, as well. 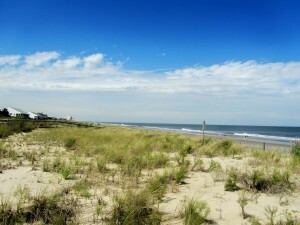 My other partner in crime, Shelley, is in Roxana, Delaware which is west of Bethany Beach. At her farm her parents are with her and a few other people. They are planning their next meal; already they have had two. She has a game planned for them. It is called “Let’s Polish Shelley’s Silver”. We will see how that goes. Shelley really would like to be with Susan. She has the Karaoke machine. Then, my husband, decided to go to the office. He has his own real estate company. You never know who would want to buy oceanfront (his specialty) during the hurricane. Would flood insurance be an issue? Finally, I do have to thank the Weather Channel. Instead of getting me all worked up this a.m., it was “comedy hours” watching Mike Seidel (from Salisbury, Maryland), anchor himself to the sand in Nags Head. Have they watched themselves during those situations. I hope they keep it going. 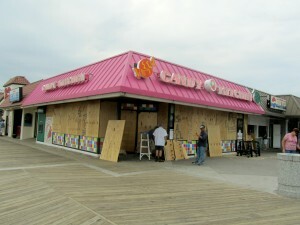 I believe Ocean City, Maryland is next on the Weather Channel’s “eye”. So, if you wonder why did I decided to write a blog? You know, already, don’t you? 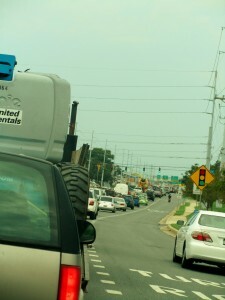 Delaware orders mandatory evacuation and designates shelters ahead of Hurricane Irene. 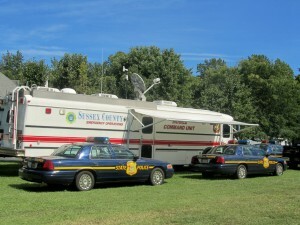 For information that may pertain to your situation, please visit http://www.sussexcountyde.gov/services/storm. 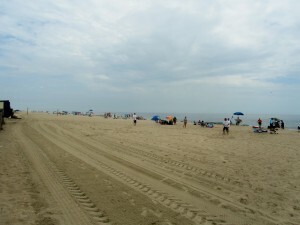 If you want to see what’s going on at the Rehoboth Beach Boardwalk you can check the live cam at www.rehobothbeachcam.com. If you are worry about your pet, please know that shelters are accepting pets, within reason. Don’t think you can take a horse, though. If you do need to go to a shelter, just check ahead of time. 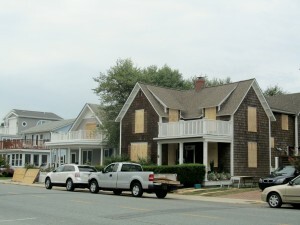 I decided to see how the town of Rehoboth Beach was reacting to the news that visitors needed to evacuate like yesterday. The first think I noticed on Rt. 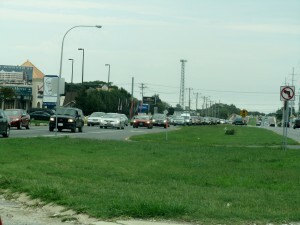 1 which is Coastal Highway, was that somewhat of an exodus was taking place. 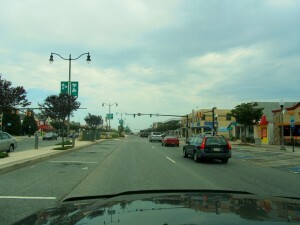 Rehoboth Avenue first looked dead, but as I got closer to the Boardwalk it was busier and people were still eating, God forbid, all the Boardwalk grub. 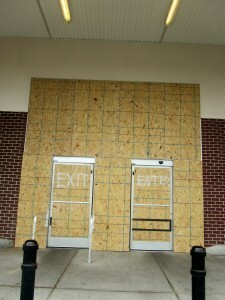 Some of the stores were boarding up. 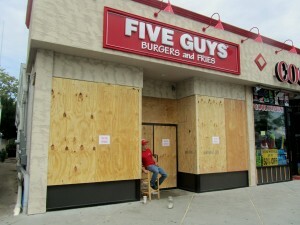 Five Guys had an “open” sign. It must have been a joke. Just one guy outside. I think he had his tip jar there, as well. 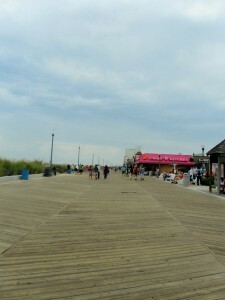 You can see that the Boardwalk was definitely quiet. 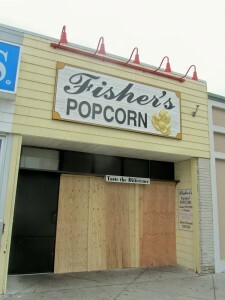 The beaches were getting ready for Irene. 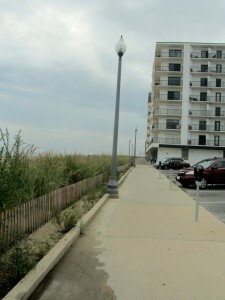 The north side of the Boardwalk was even quieter. A few houses boarding up. Safeway was open but definitely boarded. The groceries stores are well stocked but don’t look for size D batteries. You won’t find them. A lot of the restaurants will be closing. Call ahead if you are in need of eating out. 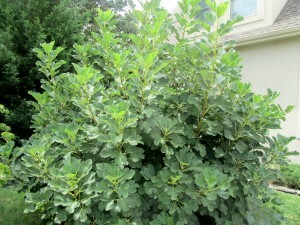 I am worried about my fig tree. Of course they are starting to get ripe. 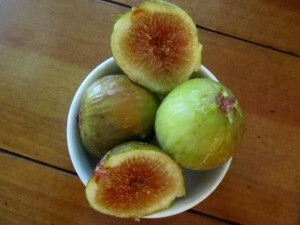 The tree looks gorgeous this year and about 400 figs or more are on the tree. I am sure they will be gone on Sunday. 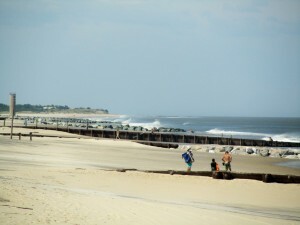 All in all, the Delaware Beaches are doing what they need to do. I think we are ready. We will see. Wish us luck. Update: Some weeks ago I mentioned that Hanna was a student from Bulgaria that had been working at Gelato Gal located on Coastal Highway in Rehoboth Beach. Her time in Rehoboth is almost up. 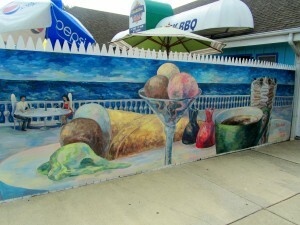 She wanted to leave us a mural that depicted the Rehoboth dining scene. Thanks Hanna. It does look beautiful and I am glad you got to finish it before the hurricane got here. Hope you can come back and visit us again soon. Good luck in your upcoming year. I met Susan Gladstone last year. 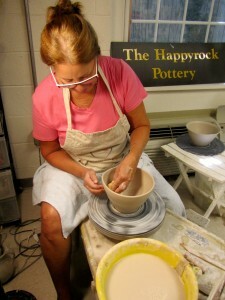 She is a potter located right here in Rehoboth Beach. 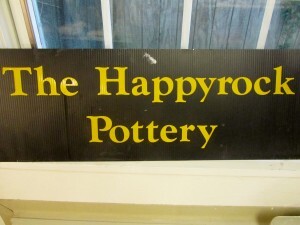 The name of her company is called The Happyrock Pottery. 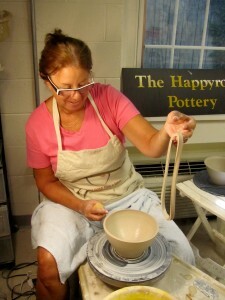 Her studio is in the shops at Celebration Mall on 20 Baltimore Ave. Tel. 410-375-7120. She does not have a website yet but if you see something on this post, please giver her a call, email her at thehappyrock@earthlink.net. Or, better yet, visit her studio. 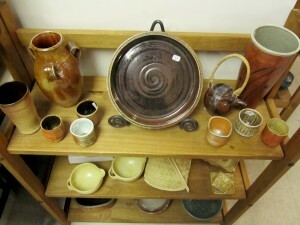 Up until a couple of weeks ago, I had never seen Susan’s pottery. 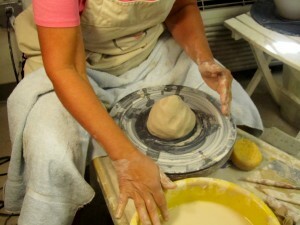 She told me that she had been a potter for 40 years. Giving it her full attention for about 16 years. Susan is a native of Baltimore, Maryland. 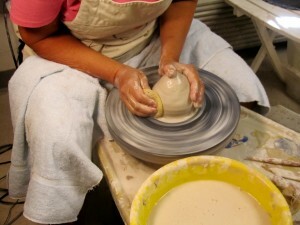 For many years she was a member of Baltimore Clayworks. 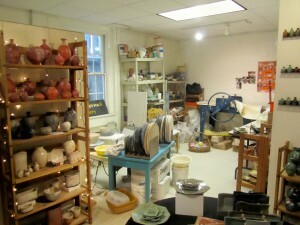 This is the region’s only cultural institution dedicated solely to the ceramic arts. 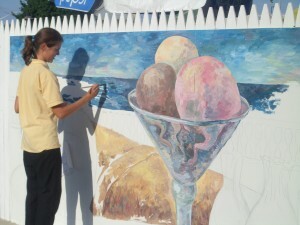 Now, she is part of the Rehoboth Beach artists’ community. She is a welcomed addition to our area. I think you will love her pieces. I decided to visit her studio. 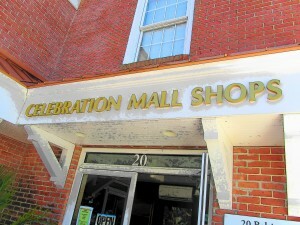 It is so funny because what is now called Celebration Mall was the original Epworth Church. Many years ago they had a great pre-school. One of my sons attended for several years; great lasting friendships were made then. 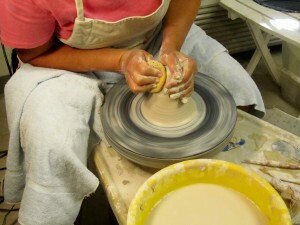 There are several artists located in the Celebration Mall. I am glad I stopped by because I had no idea. Different and very impressive. 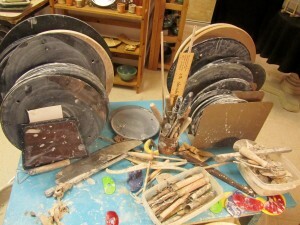 Her studio is where my son’s classroom was located. It really brought so many memories. But, I was there to see her work with her hands. 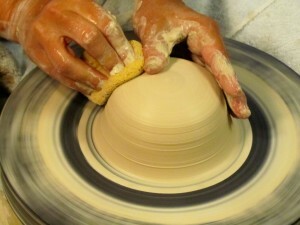 I am in awe and amazement to see someone shape a lump of clay into something as beautiful as some of her pieces. 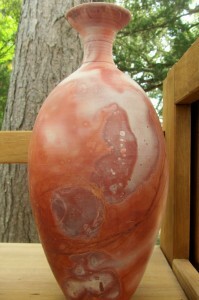 The Raku pottery has small cracks that turn black. 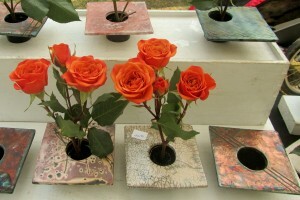 These are made by the deposits of carbon in them, turning them black, no matter what color of clay used. The final product is unique. 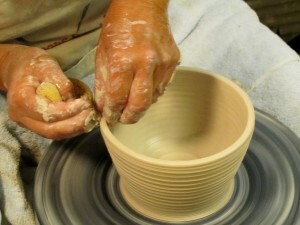 Susan was working on a “vessel” or bowl when I got there. She made it look so easy. She did a little bit of trimming and then exclaimed: It is not centered. I don’t like it. She picked it up and started kneading it just like bread. She was starting all over again. Here are the pictures from that first start when the term used is “throwing”. Susan threw that moist lump of clay on a bat. A bat is an accessory. Okay, Susan, if you say so. A lot of people just use the wheel head instead. 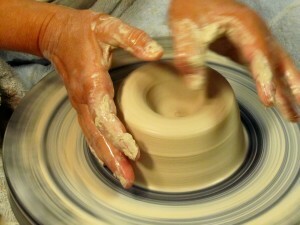 Susan found the “center” of the clay by moving a thumb across the lump until no more friction was felt. Then, the next step was the opening. 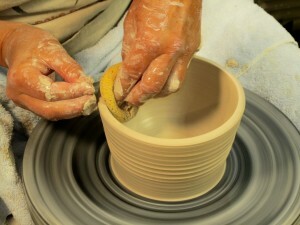 Susan’s thumbs kept working the clay and stopped very close from the bat. 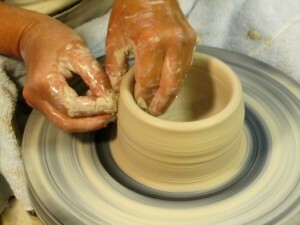 The sides are pulled up and then the process of “shaping” the vessel or bowl begins. 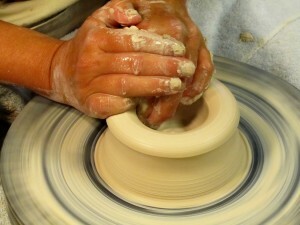 This shaping continues for some time until the desired thickness is obtained. 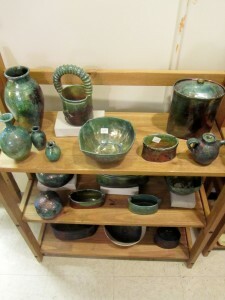 Susan has Raku pottery, as well as wood fired pottery. 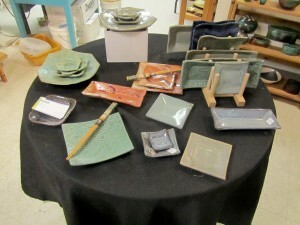 She also has plenty of very affordable pieces that are, obviously, made by hand and no two are alike. 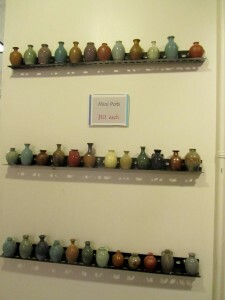 Different sizes and colors; the minis were beautiful. 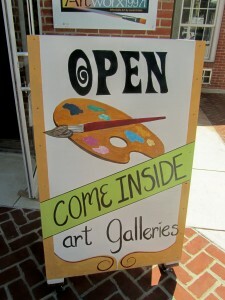 She is also a member of the Rehoboth Art League. That’s where I first saw her pottery. I learned a few things. I hope I posted them correctly. If not, I will never hear the end of it. She’ll let me know. That’s what they are called; Soupers. They have been helping Reverend Dunning for years; they are fiercely loyal to her and her mission. Now they are jumping for joy since their mission will expand. I decided to take the bus ride to the site. I wanted to see what all this was all about. First, I needed my t-shirt and badge. The location is the Lewes Georgetown Highway (Rt. 9) and the corner of Coolspring Rd. Don’t even try to drive and park there. No way, they won’t let you. It is, after all, a construction site. 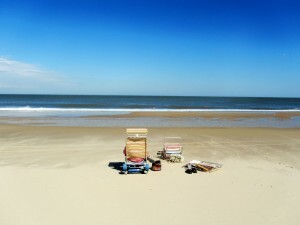 What you need to do is go to Cape Henlopen High School in Lewes. At the tent, give them your name and you will get a visitor’s badge. The bus comes and goes every 20 minutes. I kept thinking I had seen him somewhere. He looked so familiar. I found out that Elvis was riding my bus!! This Elvis impersonator was performing at the VIP tent. They had done so much by 2:30 p.m. An earthquake did not deter them. They are Extreme, for crying out loud. There was work to be done, a ranch to be finished, so idle chit chat was not going to happen. I met Tom. He was finishing his shift. Early in the morning there was filming accomplished. Tom looked tired, hot and ready to go home. Still, he had a smile on his face. I was not there for very long. But, that’s all it took to get into the excitement of it all. 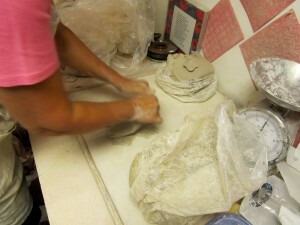 Note: Jusst Sooup Ministry website is http://www.jusstsooup.org. 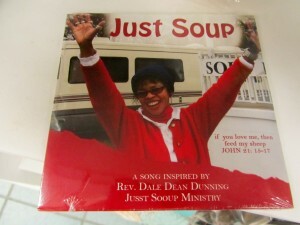 The CD with the inspired song Just Soup can be bought locally at Browseabout Books on Rehoboth Avenue. Mango Mania! 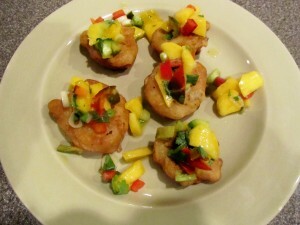 !, Recipe, A Versatile Mango Salsa, Easy, It’s that Time of the Year…On Corn Fritters? I had to laugh. 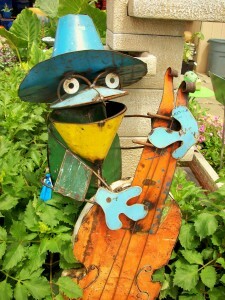 I got an e-mail from the Delray Beach Green Market. This market is the one I visit when in Delray Beach, Florida. Just like the markets in Delaware, it is that time of the morning when you can stroll and get fresh baked goods, produce, and flowers, while sipping your coffee. Great way to start the day, by the way. 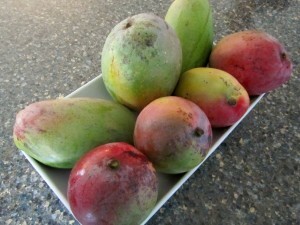 I laughed because it said that in August, in South Florida, the mangoes are falling off the trees. Ha ha. Here, in Delaware, I found that Giant was having a sale; 4 for $5.00. I bought them. Why not? I love mangoes, probably as much as I love ice cream. Growing up in Puerto Rico I remember sitting with a bag of mangoes and just diving into them; peeling them with my teeth; eating that sweet flesh. I am not kidding, no knife was needed. Some of the mangoes had fibers and some of them were just perfectly round. If you do want to know how to eat a mango without getting messy, then go to You Tube and on the search put How to Eat a Mango. There is an informative video for you to check out. Still, in my book, you need to get messy!! In a perfect world I would love to pick them directly from the tree. But, since beggars can’t be choosey, then a grocery store is probably the best bet on my neck of the woods. 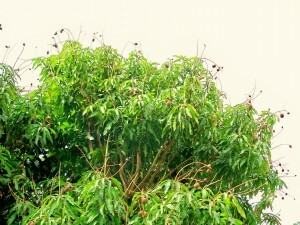 Mangoes are native of India and are the most cultivated fruit of the tropical world. Full of vitamins, as well. 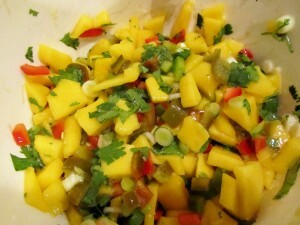 The Fresh Mango Salsa is one of those that you can add a little bit of this or a little bit of that. You want a little more of a kick? Then, add more jalapeno. Don’t like the cilantro? Well, then you know what to do, but it does add so much. The Mango Salsa is very versatile; on fish, pork, hamburgers, salads, omelettes, corn chips, or you can do like I did and top corn fritters with it. Mix all ingredients in a medium bowl. Cover and allow the salsa to rest at least 30 minutes before serving. It is really good. I love the combinations of the jalapeno, mango and cilantro along with the citrus flavors of the lime and lemon juices. When I first came to Baltimore in 1976 someone introduced me to a place in Maryland that used to serve Whiskey Sours with a basket of corn fritters. I always remember that and as I made them, my thoughts went back to those times long ago. You want the mixture to be nice and thick in order to drop them by the spoonfuls in hot oil. Fry them until they achieve a nice golden brown color. Careful not to burn. Place on paper towels to drain. Then, just serve them like I did; with the Mango Salsa. Could be an appetizer, a tapa, or a side dish. Corn fritters go well with ham or poultry. But, they are delicious with maple syrup, butter or jelly. Combine corn and egg. Stir corn and egg mixture into sifted dry ingredients until just blended. 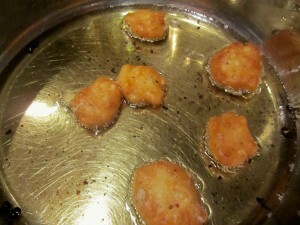 Drop batter by tablespoons into hot oil. Fry for a few minutes, turning once during frying. Drain on paper towels. Note: Since we have an abundance of corn in the summer, using fresh corn is the way to go. In a hurry? Use canned corn.